The twenty-first century heroine fights in a Prada dress, in the jungle of big cities, not for world peace but for bargain buys. Today’s heroines also have to be versatile to meet the requirements of post-feminism, popular culture and neo-liberalism: they work, they care for friends, they have to fight for Mr.Right (so they don’t end up as a spinster eaten by cats), they do Brazilian Waxing and most importantly, they shop. When Helen Fielding’s Bridget Jones stated that she had decided to “go shopping and stop obsessing” (Fielding 80) it seemed as if a wall was pulled down and women in Chick Lit went shopping as if there was no tomorrow. Thanks to credit cards, there is indeed no limit. On the one hand, those women are mostly educated and independent with a solid income, but on the other hand they get into debt for the newest Hermes scarf to achieve an ideal which is propagated in popular culture. Here the question emerges: What significance does the fashion and beauty industry have for women in the 21st century? This essay will answer that question, proving that while the fashion and beauty industry as well as post-feminism propagates the economic independence of women and, in connection, massive consumerism as a symbol for the liberation of women, shopping instead reflects the subliminal oppression of women by the market. The background and theoretical framework for this thesis is provided by Angela McRobbie, one of the leading feminist theorists of the 21st century, who states that the fashion and beauty industry “appears to displace traditional modes of patriarchal authority” (McRobbie 61). My object of analysis is Sophie Kinsella’s Chick Lit novel Confessions of a Shopaholic, as to the heroines in Chick Lit shopping is a central and essential part of their lives and is presented as a way to create one’s identity, according to the ideals of popular culture under the guidance of the fashion and beauty industry. Chick Lit heroines are often presented as fashionistas who define themselves by the clothes and brands they wear always desperately trying to prove their individuality and to confirm their identity. Free and excessive shopping is put on a level with liberation and emancipation, as Chick Lit fashionistas are economically independent working women. This is where the aspect of post-feminism comes into account, as it goes hand in hand with neo-liberal ideas like freedom through economic independence, individuality and competition. Therefore consumption is necessary for the construction of identity, not exclusively for the self but also for our articulation of identity amongst other members of a cultural group, since according to Jean Baudrillard, consumption “is directly and totally collective” (46). Baudrillard further observes in his essay Consumer Culture that consumption ensures a form of communication among social groups and a “failure to communicate would be regarded by others in this context as anti-social” (46). If female identity is constructed in relation to consumption as a form of social interaction, what role does the market, especially the fashion and beauty industry (as it is targeted especially at women) play in there and what does it contribute to the post-feminist climate? During the years of feminist struggle with patriarchy, women have seemingly achieved equality. Angela McRobbie describes in The Aftermath of Feminism that young women “come forward and make good use of the opportunity to work, to gain qualifications, to control fertility and to earn money to participate in the consumer culture which in turn will become a defining feature of contemporary modes of feminine citizenship” (McRobbie 54). Consumer culture plays indeed a very important role in the post-feminist period, because a new group of customers has conquered the consumer landscape, the group of well-educated, middle class, working women. Suddenly women are in the spotlight of attention, but they become visible in a certain kind of way, presenting a “new category of womanhood” (McRobbie 55-56) embracing an identity forced upon them by the fashion and beauty industry as well as popular culture. In The Aftermath of Feminism McRobbie establishes a connection between consumer culture and the false propagation of female ‘freedom’ in post-feminism and a neo-liberal technique to subordinate and oppress women by implementing “new neurotic dependencies” (McRobbie Introduction) upon them. McRobbie states that the meaning of the identity of the girl and the young women is determined in relation to her “capacity, success, attainment, enjoyment, entitlement, social mobility and participation” (57). She further examines that “woman have to come forward as more active agents in the socio economic system, they are charged with carrying out different, more aggressive roles“ (125). Therefore the notion of womanhood is “re-shaped so that they fit with new or emerging (neo-liberalised) social and economic arrangements” (57). Consumer landscape, including commodified culture like the media, is now directed towards the growing “population of women consumers” (57). The embracing of neo-liberal ideas and the abandonment of critique is what McRobbie identifies as the main components of a “new sexual contract” (57) where it’s all about “what a girl can do” (57) but only within the limits of the system of neo-liberal capitalism. Feminism is rejected as being outdated and unattractive and most importantly superfluous as the ‘girls can do it’ idea of feminism is transformed into ‘girls can do it for neo-liberalism’ as “the logic of global capitalism is to loosen women from their prescribed roles [as feminism intended as well] and grant them degrees of economic independence”(Mc Robbie 61). This cannot be contributed to a seemingly rising feminist consciousness in political and economic issues, but rather to the immense productive capacity and purchasing power, neo-liberalism detected in working women. Therefore women now have to participate in consumer culture, as denial would be judged as a failure in communication and as anti-social (Baudrillard 46). Economic choice and economic independence equals freedom in the neo-liberal discourse and subordinates social and political liberation. Therefore women are led to believe in equality and freedom through economic choice but instead they support the patriarchal system of neo-liberal capitalism which oppresses women continuously. This is promoted to young women through the media. McRobbie correctly states: "Popular media and consumer culture have developed very sensitive scientific tools for addressing this sector of the population, and it is in this media-landscape that a vocabulary of hyper-individualisation is successfully realised" (2). Nevertheless, McRobbie only points out TV shows and women magazines, but her analysis completely ignores one very important medial platform which emerged side by side with post-feminism: Chick Lit. Chick Lit is "lighthearted fiction for women with strong ties to romantic comedies" (Harzewski 16) and portrays the "fetishization of commodity culture and its ambiguity of its protagonists' identities as independent subjects and objects of hetero sexual exchange" (16). Although Chick Lit is often meant to be 'ironic' it highly influences especially ‘"young people, because they have an insecure sense of their own identity, love reading books that confirm that identity" (Barker quoted in Guardian ,Bainbridge Denounces Chick-lit as 'froth'). 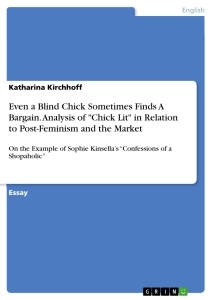 Chick Lit is in itself a symbol of the neo-liberal, post-feminist period, because as Caroline J.Smith explains in her dissertation Cosmopolitan Culture and Consumerism in Contemporary Women's Popular Fiction nowadays “agents and editors read a[Chick Lit] writer’s marketing plan before they read the submitted manuscript” (Smith 8) and therefore Chick Lit itself is highly commercialized and incredibly successful in selling numbers. This essay will therefore continue with a broader explanation of Angela McRobbie’s theory about the post-feminist ‘masquerade’ in relation to the oppression of women in post-feminism by the beauty and fashion industry. Moreover, I will prove that the analysis of Chick Lit is essential in the context of McRobbie’s theory as it brims of post-feminist propaganda. As a prime example Sophie Kinsella’s Shopaholic series will be analysed.